Home » Phenomenon » What is Merapi Lava Dome ? Magma with high density and viscosity when the exit to the surface will experience a cooling which then settle and accumulate in the crater to form a mound of lava dome. If the growing lava dome exceeds specific limits related to the strength, thickness, and slope and by the force of gravity, then the dome will collapse to produce pyroclastic avalanches. Lava dome has an important role in the process of eruption, which are the hallmark of Merapi, which is a lava dome growth and destruction. 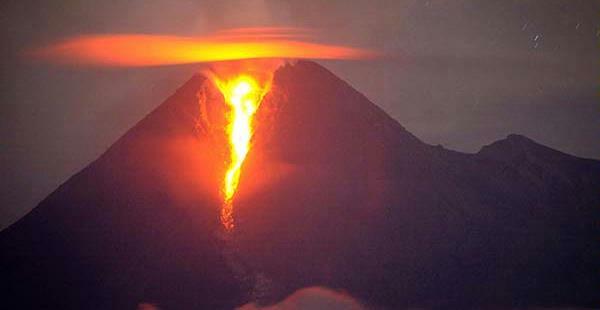 Lava dome can be observed visually. An important parameter to be monitored in general is the morphology, volume, and the topographical location of dome growth. Before the technique of photography was invented, the dome observation analysis is done through hand sketches. Once the camera photography with film discovered and developed, gradually shifting the role of the sketch. In the current era, the development of digital photography technology helps the analysis process more accurate observation dome. Satellite photos, the cost is very expensive, sometimes very necessary as a comparison of photographs taken from the earth's surface. Geodinamika Context: Convergence of the Indo-Australian Plate with the Asian continental plates. Petrology: basaltic-andesitic magma type. Eruption dynamics: leleran lava dome formation, there was hot clouds, and occasionally explosive. (Source: BPPTK Yogyakarta).